On the morning of July 11, 2015, the Park Avenue Hotel in the lower Cass Corridor was demolished to make way for The District Detroit, a $650 million, publically subsidized development consisting of a new hockey arena for the Detroit Red Wings and several new residential neighborhoods. Spectators cheered at the implosion set off by 200 pounds of TNT. Preservationists, however, were ambivalent. While they failed to save the Park Avenue, they did coax assurances from owners Olympia Entertainment, Red Wings owner Mike Ilitch's management company, to rehab the adjacent Eddystone Hotel -- a rare truce in which battles between the camps of hardline preservationists and developers have had difficulty finding common ground. That's because, historically, Detroit has a mixed record of preservation. From the Old City Hall to the Hotel Pontchartrain, Detroit has routinely demolished older buildings in the name of progress. But these debates became more pronounced in the past decade with the city headed towards insolvency and struggling to maintain its numerous abandoned buildings and find people willing to invest in them. Much of the enmity between preservationists and developers began almost exactly a decade ago over the fate of the Madison-Lenox Hotel. Two buildings designed by two architects at the turn of the 20th century and combined into one, the Madison-Lenox's story resembles that of many downtown structures -- abandoned in the 1990s during an economic low point and left to deteriorate. Gritty details aside, a spirited fight was mounted to save the hotel. One preservationist even stepped in front of a bulldozer with a stay order from the court. 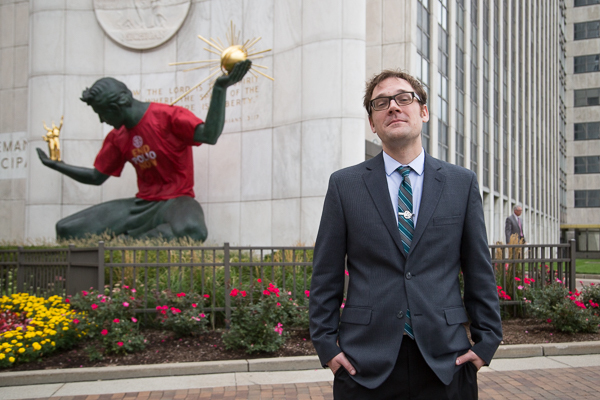 "It felt like we were under assault from the downtown forces -- the city, Olympia, the Detroit Economic Growth Corporation," says Francis Grunow, former director of Preservation Wayne (now Preservation Detroit), of the mood at the time. Dan Austin, who runs Historic Detroit, a website that documents Detroit's landmarks, and has written two books on the city's architecture, describes the fight over the Madison-Lenox as "Detroit preservationists' Alamo." 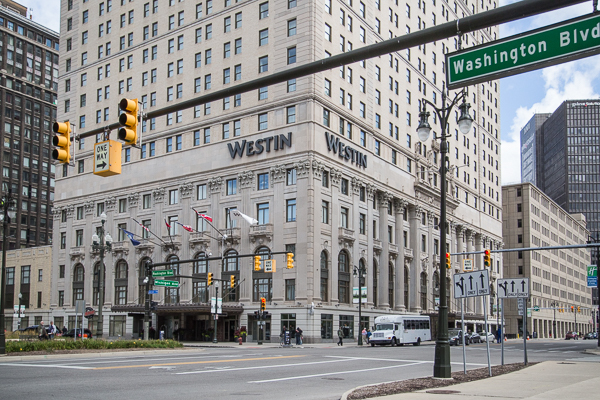 Like the Park Avenue Hotel, also owned by one of Mike Ilitch's holding companies, the Madison-Lenox was eventually demolished in May 2005. But since then, there have been many notable renovations of previously abandoned buildings in downtown Detroit, such as the Book-Cadillac Hotel and the David Whitney, where investors poured $92 million into a stunning and faithful restoration. But an equal number of buildings of historical significance have been demolished, including Tiger Stadium, the Statler Hotel, Cass Technical High School, and the Lafayette Building. The Book-Cadillac Hotel renovation, considered a major preservation victory, demonstrates both the successes and frustrations surrounding this issue. Renovated at a cost of $190 million and reopened in 2008 after being closed for 24 years, the Book-Cadillac became a test case to see if it was worthwhile to invest in historic architecture. Beyond some grumblings about the authenticity of the restoration, preservationists largely rejoiced -- the exterior looked stunning and the building had a tenant in the Westin hotel. "The Book-Cadillac was symbolically very important," says Grunow. "Having it come online after being abandoned for so long was crucial for investment in future projects." But the Book-Cadillac was across the street from the abandoned Lafayette Building. The only non-theater designed by C. Howard Crane and conforming to the V-shape at the intersection of Lafayette Street and Michigan Avenue, the Lafayette was a truly singular building. But by 2008, it had trees growing from its rooftop, was covered in graffiti, and was supposedly an unsightly blot in view of the Book-Cadillac's hotel rooms. The city, claiming it couldn't maintain it, moved to have it demolished. Preservationists rose to its defense, but the momentum was already against them. Austin and others tried to get the Lafayette Building on the National Register of Historic Places, secure tax credits, and find a buyer. In a case of cruel irony, however, it was saving the Book-Cadillac that likely contributed to the demise of the Lafayette, which was demolished in 2009. "Personally, that was incredibly demoralizing," says Austin. "I really poured myself into saving that building." If the main issue was the state of the Lafayette, Austin believes that the money spent on demolition should have instead been put towards securing the building and removing graffiti. "Their solution was like saying, 'Oh my God, there's a fly on the wall. Quick, grab the sledgehammer.'" From some preservationists' perspective, local economic development and planning agencies like the Detroit Economic Growth Corporation (DEGC), the quasi-public agency that works closely with the city of Detroit and other partners to support existing businesses and to bring new companies and investments to the city, have not done enough to preserve Detroit's rich built environment. The DEGC, under the guidance of its former president George Jackson, had the Lafayette, among other buildings like Tiger Stadium, demolished. "We don't create economic conditions," says Olga Stella, chief operating officer at the DEGC. "And when we can't make a project work, we're blamed. I can understand that. But we make decisions based on the best information we have at the time." Stella sees the DEGC as a positive force for preservation, citing the "extraordinary efforts" they took to rescue the Book-Cadillac (including an exceptionally complicated financing package), and its faced improvement, brownfield redevelopment, and Motor City Match programs, which help secure funding for historically significant buildings. "We've always cared about preservation," says Stella. "When you actually examine the impact and look at a list of wins we've facilitated, you start to see a much more nuanced picture of our track record of revitalization." While preservation activists like Austin and Grunow are thrilled that so many of Detroit's skyscrapers are going back online, they describe many decisions that resulted in demolition as short sighted. "You can't replicate these buildings," says Grunow. "In many cases, they were works of art, constructed at a time when we had money and resources and labor at our disposal." Not everyone agrees that all these buildings are salvageable. To take the most recent case, the Park Avenue Hotel in no way resembled the Tudor beauty as constructed in 1923. Abandoned in 2003, exposed to the elements and scrappers, it had been in a steady state of decay. And yet, preservationists were desperate to save it. 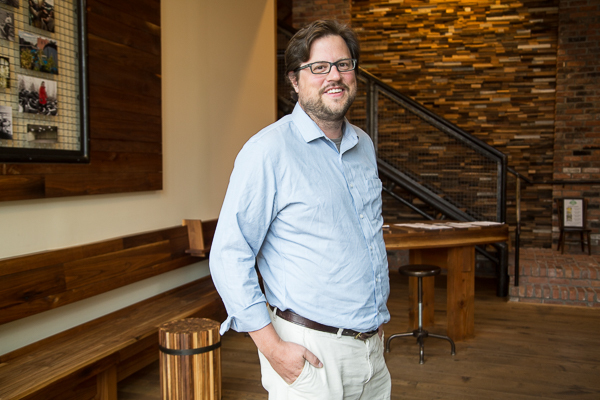 "Today, buildings are being rehabbed left and right," Austin says. "The Grand Army of the Republic, the Whitney, and the Fort Shelby were all considered eyesores, and now they're beautiful. It's no longer valid to argue that if a building's been abandoned for over a decade it can't be salvaged." "The way to build a city back up is not to tear it down," he adds. 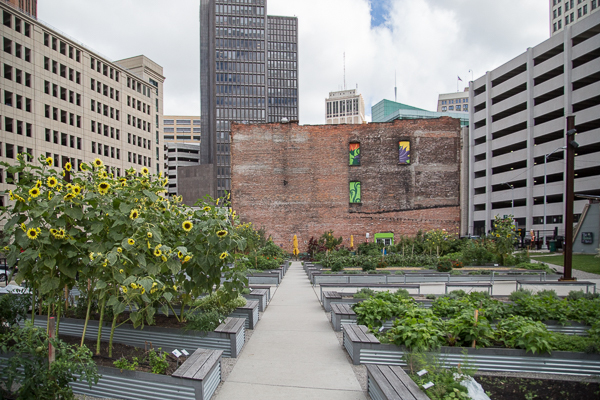 None of the sites formerly occupied by the Madison-Lenox Hotel, the Statler Hotel, Cass Tech, or the Lafayette Building have been developed beyond ground-level parking lots or, in the Lafayette's case, a quasi-public garden. Within the last year, Larson Realty Group revealed plans to turn the former Tiger Stadium site into a mixed-use commercial and residential development that will incorporate the Navin Field configuration. Fortunately, debates like the recent one over the Eddystone and Park Avenue Hotels will become less frequent thanks to improved economic conditions in the central business district, where most of the major preservation battles have been fought. Also, because of the past decade's flurry of demolition and redevelopment, there are simply fewer abandoned buildings left as potential battlegrounds. Stella, too, is confident there will be fewer demolitions in the coming decade. "Where do residents take tourists when they come to Detroit? The Guardian Building. The Fisher Building," she says. "I think there's a growing recognition, across the spectrum, of the value of preservation. There's only going to be more opportunities to preserve buildings." This story is the latest in Model D's "10 Years of Change" series celebrating our decade of publishing in Detroit. Read other stories in the series here. Support for "10 Years of Change" is provided by the Hudson Webber Foundation.